Ok this is my try at making the Old Town from Sims 1 game for Sims 2. 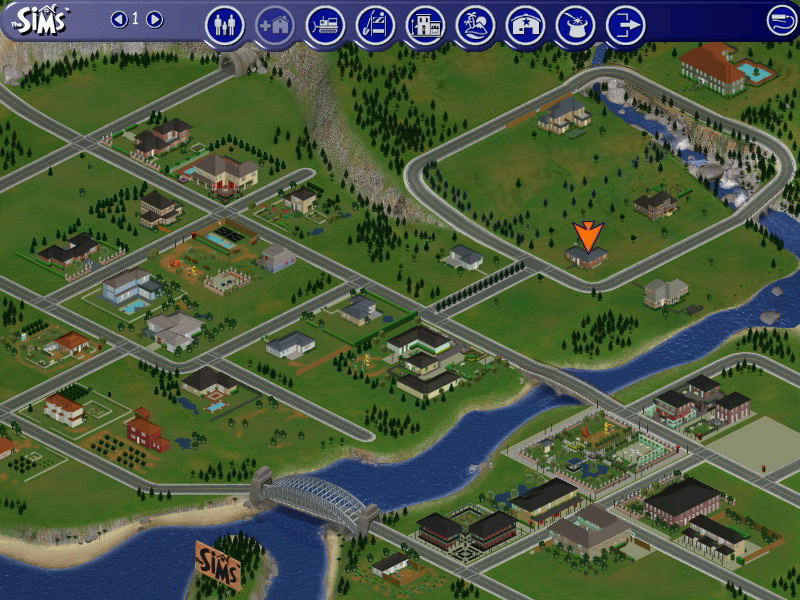 This is an accurate recreation of the Sims 1 Old Town as the Sims 2 base game will allow. 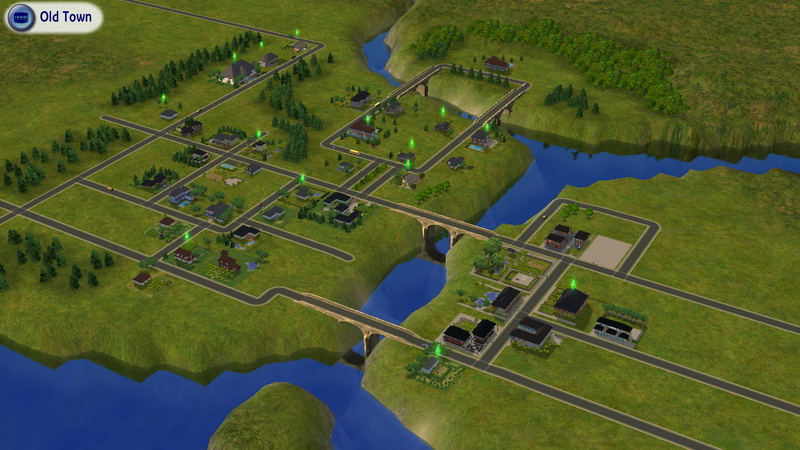 Old Town was introduced in The Sims: Unleashed and is an extension of the original neighborhood screen. The original area now takes the top-right quarter area while Old Town is in the bottom-left. Old Town appears in all neighborhoods, and is the same in all neighborhoods. There are many new lots, and there are now shops, pet stores and gardening centers scattered around SimCity. The town's founder Gunther Goth formed the town while seeking a better life for his wife Cornelia and son Mortimer. The area left of the river is mostly populated by residential lots. The smaller area to the right of the river seems to be the wealthier part of town, despite the Hicks' trailer, and contains the home of Gunther and Cornelia Goth. The town is very similar to New Orleans, rich with the jazz music, period architecture, and voodoo shops. Old Town is presumed to be the left-hand area of Pleasantview, where Sims such as Cornelia Goth and Mama Hick live. I have used the AGS program making a clean and empty environment with no Maxis content to make and were possible I use extracted and clones Pleasantview Sims for this. IE Gunther Goth and all other Sims from Pleasantview who were in the Old Town hood from Sims 1. I have included all the Goth's, Crumplebottom 's and Bachelor's as ghost in the Goth lot, I have made Michael Bachelor as Bella Goth brother from clones of both. Dead Sims in Mortimer Goth's lot. I have included all the downloadable family from the original EA/Maxis Sims 1web site. Hatfield, Jones, Agent, Valentino, Maximus and Snooty Patooty families. Plus all other palyable families that came with the Sims 1 plus EP's. Some of the downloadable houses that were on the EA/Maxis Sims 1 web site had extra downloads that I did not get so to that end I made all houses as they are in my Sims 1 game only using what the Sims 2 base game will allow. This only needs the base game to play. No camera mod needed to play as it is. 1. Download the rar file for which one you want. Old Town with Sims.rar With Sims or Old Town No Sims.rar Without Sims. How to install this hood. Put the SIM1 folder into your Documents\EA Games\The Sims 2\Neighborhoods folder. Put the SIM2 folder into your Documents\EA Games\The Sims 2\Neighborhoods folder. Thanks to Broomhilda for the Old Town SC4 which I have made a lot of changes to. I have flatten out most of the map to fit my play style.